located at our Welwyn Garden City depot. We are proud of our dedicated delivery team. You can count on our professional and reliable service. We have three fully stocked warehouses, packed with quality goods. 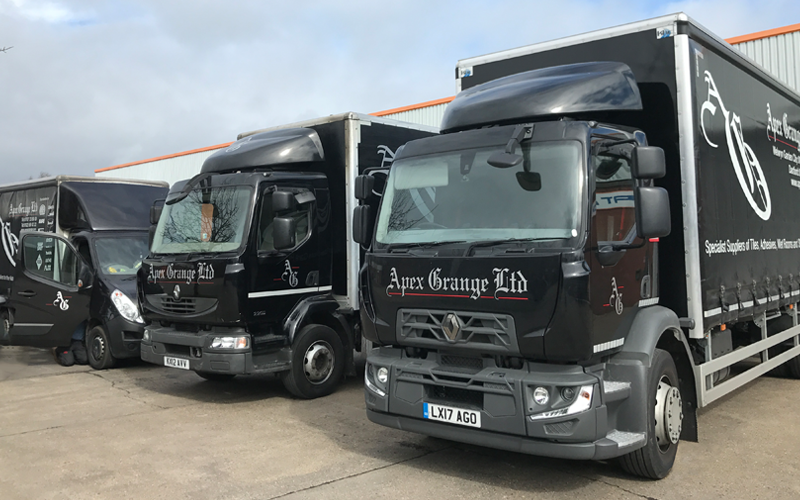 Apex Grange is an independent family run business that offers a one-stop-shop for Tiles & Tiling Supplies to both trade and retail customers. We are based in Welwyn Garden City (Hertfordshire) & Dartford (Kent). We have a Trade Counter open 7:30am-5pm Monday-Friday. We have a Trade Counter open 8am-5pm Monday-Thursday and 8am-4pm Friday. All the products we stock are great quality. We listen to our customers to make sure we only stock the best goods. With 25 years in the business, we know what we are talking about. We can help recommend products and give advice. With our dedicated team members, you can rely on us to provide you with great service, from placing an order, through to delivery. We are proudly a family run business, and transfer our family values into all that we do at Apex Grange. We recently opened a Tile Showroom in our Welwyn Garden City depot – boasting a great selection of quality tiles. Visit us today and have a chat with our tile manager Jonathan. We proudly stock all of these quality brands. Click on a brand to discover the products that we stock. Interested in opening a trade account? Contact our sales team at your nearest store.